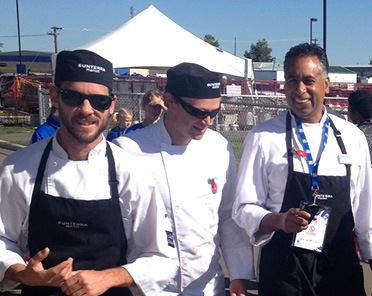 Raj Nandamudi, Sunterra’s Standardization Chef, didn’t cook until he was 20 years old. He was midway through a hotel management diploma when he stepped into the kitchen at Taj Palace, the place for chef training in Mumbai, India. “It was a total wow moment. I thought, this is thrilling. I want to do this,” says Raj. And he’s been doing it since. Gaining experience with the InterContinental, Hilton and Fairmont groups around the world, Raj has worked with every major cuisine. 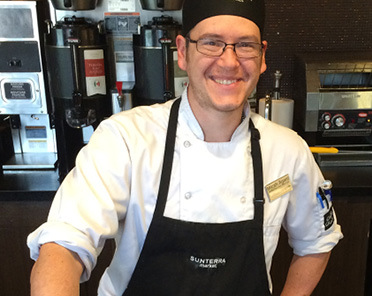 Even so, he credits Sunterra’s varied menu not on his diverse background, but on the different perspectives of the more than 250 chefs he trains and works with. Every month, market chefs from all nine locations meet for a workshop where they make and taste all the foods to be featured in the following month. The chefs give their feedback and ideas about the recipes, which Raj then adjusts. Besides, who knows what their customers want better than the chefs who serve them every day? 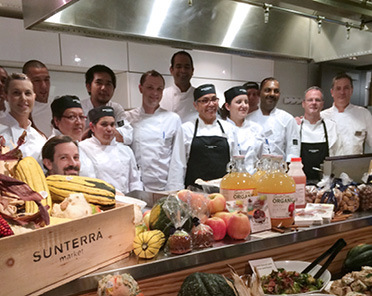 The open concept kitchens at Sunterra allow customers to interact directly with chefs, says Raj. And just as each market is built around what its community wants, each kitchen sets its own menu based on what’s fresh, what’s in season and what customers are asking for. This means you’ll find slight differences from market to market, he says. For example, the Thai noodle soup at West Market Square is broth based, but at Lendrum it’s creamier. This flexibility has led to favourite recipes being developed in specific markets and adopted across all kitchens; the ever-popular bison salsa burger hails from Lendrum and the mouth-watering chipotle brisket comes from TransCanada Tower, to name a few. No matter the menu, says Raj, the kitchen has to be up to the quality that people expect. (And with up to 70 items coming out of the kitchen, that’s no easy feat!) From the deli display cases to the grab ‘n’ go sandwiches, customers see the food up close before they buy it. “At Sunterra, the importance of quality stands out,” says Raj.